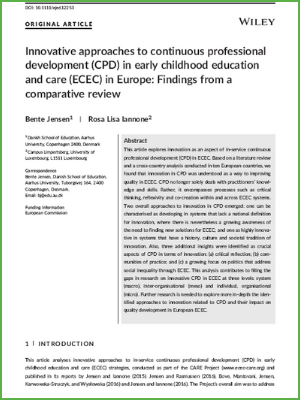 Innovative approaches to continuous professional development (CPD) in early childhood education and care (ECEC) in Europe: Findings from a comparative review explores innovation as an aspect of in-service continuous professional development in ECEC. The analysis is a contribution to research on innovative CDP in ECEC at the micro, meso and macro levels. The authors suggest more research into in-depth and identified approaches to innovation related to CDP and their impact on the quality development in European ECEC.